I read this article and found it very interesting, thought it might be something for you. The article is called Wyvern Lingo + Saint Sister at Brewery Corner Kilkenny and is located at https://www.totallydublin.ie/music/gig-previews/wyvern-lingo-saint-sister-at-brewery-corner-kilkenny/. Fresh from thrilling crowds at Electric Picnic, Bray trio Wyvern Lingo release their debut single for Rubyworks on Friday 27th November. Wyvern Lingo will be embarking on an Irish tour to coincide with the release of ‘Subside’. Friends and bandmates since school days, Wyvern Lingo share a gift for close harmony, keen song craft and effervescent live performance which belies their tender years. Taking influences from pop, folk and R’n’B, their voices interweave to create a fresh sound which is forward-looking yet unafraid to celebrate tradition. The band released their debut EP in Ireland in 2014, and toured with Hozier in the UK and at home, with Karen and Caoimhe both putting in a double shift by singing backing vocals for their Wicklow friend. Karen also duets with Hozier on the haunting “In A Week” on his bestselling debut album. 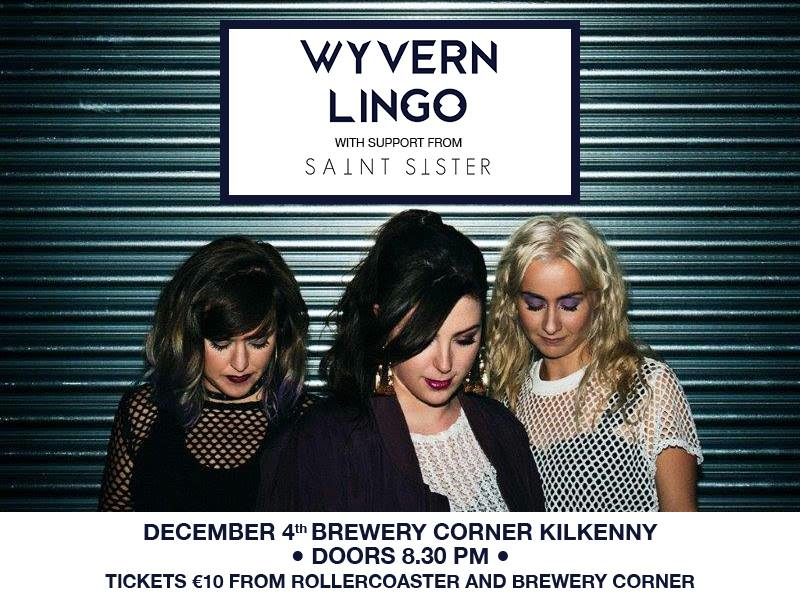 Wyvern Lingo play at Brewery Corner, Kilkenny on Friday December 4th 2015, with support on the night from Saint Sister. Tickets priced €10 are available now from Brewery Corner and Rollercoaster Records. Contact Brewery Corner to reserve tickets on (056) 780 5081.